This video is simply amazing! You must watch to the end. Trust me - it gets better! I have to chuckle, many of my Feel Good Moments over the years have had a "keep going" theme. It takes perserverance to keep going when all the odds are against you. This story will amaze you! ALL the odds were against these boys and they just kept going. Where in your life do you need to keep going? Let this story inspire you. monday morning muisng AND feel good moment: YES, you can! 2012 will be the most amazing year of your life so far! Todays' musing and feel good moment are one and the same. Nick has had a previous showing as a Feel Good Moment because he is so amazing. Let his story propel you into 2012 with excitement, expectation, and a feeling that you CAN do what you want to do. For the past four weeks I have been guiding you on a journey to a fabulous new year. I have challenged your beliefs around not having enough time to do what you want, not feeling like you in control of changing that which needs changing in your life. I have reminded you to dream and had you choose one thing that you want to be sure is different one year from today. Are you feeling now like you could make a change? That you really can do something different in 2012? Then, it is time to take some action! Oh, and one more! Join me in Mexico in February so I can inspire you directly! Now that you have began to dream about your life and what you really want, what would you like to create for 2012 to get you closer to your Big Dream? Just so we get this straight, I don't care if you think it is possible or you are capable of it, that comes later. For now, set your intentions for the year based on what you really want for your life; let the excitement of your Big Dream get you excited about your intentions. “We must learn to reawaken and keep ourselves awake, not by mechanical aid, but by an infinite expectation of the dawn.” (Henry David Thoreau) Let your Big Dream be the dawn; start expecting it! Fourth Assignment: (Although you probably figured this one out! 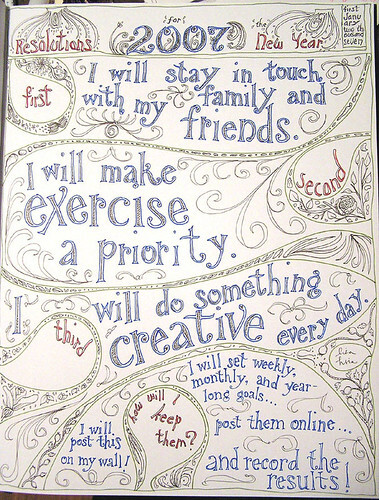 :-) ) What do you want to be able to say about your life? Is there something you want to have? A way you want to be? Think about it and write it down...Did you know: You are 200% more likely to achieve a goal if you write it down. You are 400% more likely to achieve a goal if you tell someone. SO, I would like to support you in achieving this goal! Add to the comments on the blog post what it is that you want to have by 12/19/12 between now and next Sunday. I will randomly pick someone from the comments to receive my Goal Setting From the Heart E-Course. Come on...you have nothing to lose and everything to gain! New Year's Resolutions From the Heart: The 40-min podcast with workbook is now available to inspire you on New Year's! More info and to register. This one is the most amazing mind-bender! New Year's Resolutions From the Heart: Join me on Friday, December 16, 11:30-12:30 for a teleclass (done over the phone) on the three steps for creating resolutions from a deeper, heart-centered place. (Call is recorded so join even if you cannot make it!) More info and to register. To make up for last week, this one is shorter! Enjoy and feel the excitement...your dream is worth following! This one simply felt good to watch!